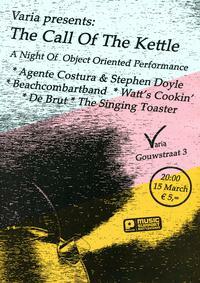 Agente Costura and Stephen Doyle are a duo playing improvised sounds, on amplified sewing machine and drums. Constura has been playing the Singer since 2003. In the daytime she tackles unwanted clothing, transforming them into new wearable shapes. At night, the Singer joins her fellow musicians and Lisa sews to the beat of the music, improvising on clothing based on rhythm and sound. Lisa has performed extensively, for instance at The Vancouver Art Gallery, the Month of Performance Art Berlin, the Bimhuis Amsterdam, and Curitiba Fashion Week. Stephen Doyle is a drummer, living and working in Amsterdam. His sounds have previously graced the creations of Dagora, 78rpm, and many more. Together, Costura and Doyle create a percussive upcycled torrent of uniquely sculpted sound. Watt’s Cookin’ is composed of Zeynep Aslan, Tamara van Suylekom and Inge Hoonte who met through re#sister and rehearse at Worm. For this performance, the three have teamed up to bang, clang and tinker with everyday household items. They are currently rehearsing in Inge's kitchen with the orchestra members they’ve interested to participate, such as water cookers and coffee percolators, a knife and a cutting board, a few jars with nuts, rice, and corn, and a couple of empty jars, a mini oven, two pans, two tea spoons and an egg beater. A bread toaster and a coconut milk can are hesitant if they want to join this upbeat troupe, but they will probably fit right in! De Brut is a new project by Marijn Verbiesen who, according to sources, is "one of the forces that keeps the Rotterdam underground together!" She has participated in numerous projects (Sweat Tongue, Red Brut) and is active as one of the organizers of the infamous Herman concert series. Besides that Verbiesen is renowned for her tape collages that are highly personal and highly regarded by magazines like The Wire. Beachcombartband is a one-man-sea-trash-band from Rotterdam, helmed by none other than Bart Koppe. He performs with a collection of marine debris, played by mechanics and by hand. He will sweep the beach and throw its garbage on your head, in a maze of audio galactic joyfulness. The Singing Toaster is not like other toasters, because not every toaster is able to sing. Therefore the inclusion of this one during ‘the call of the kettle’ is somewhat of an occasion. Will the burned crumbs between its heating elements be enough to warm your heart?